Sybrich Willemsma is a HR-professional who is driven by her mission to “change the game” of innovation by “pressing the button” in HR. She advices (international) companies and helps to grow the business in a less obvious way: by increasing Happiness. She challenges clients to think differently and act in a more innovative way. Creative, always with a smile and eager to “challenge the status quo”. Sybrich has a background in marketing and HR. She has a broad experience in international search, recruitment and employer branding. After starting her career in recruitment she joined NMC Nijsse as a consultant Executive Search. 10 years ago she started as an HR consultant working on organizational development for large corporates and “hidden champions”. Sybrich is always eager to learn and is open to embrace newest developments to create growth and innovation inside an organization. In her mission to make you smile on Monday morning she likes to use tools and techniques that create a smile. Sybrich likes to develop serious games and uses gamification solutions to make learning, change and transformation more immersive and more attractive. Motto: keep it simple and make it more fun. Inspired by people like Verne Harnish and Alexander Kjerulf she created a the 6C-model for Happy Results. A practical tool that combines insights of the business growth model of Rockefeller Habits with the insights and best practices around Happiness at work. It is designed to create strategic alignment between HR and the organization’s goals and therefore to increase the added value of HR. Sybrich partners with different colleagues to offer the best solutions to create Happiness. She works with ELP | Realising Breakthroughs, an international network company focused on realizing breakthroughs in the co-creation of new directions – in terms of strategy, positioning and identity. To transform, renew and inspire your organization – from within. To build strength inside and relevance outside. 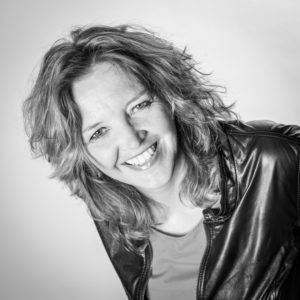 She works together with Bastiaan van Noort of Impact Masters Entrepreneur and business coach to grow organisations to their next level. Together with 4Challenge we develop serious games in order to offer an unique playground for serious questions; for instance: leadership games, entrepreneurial games or sales games.